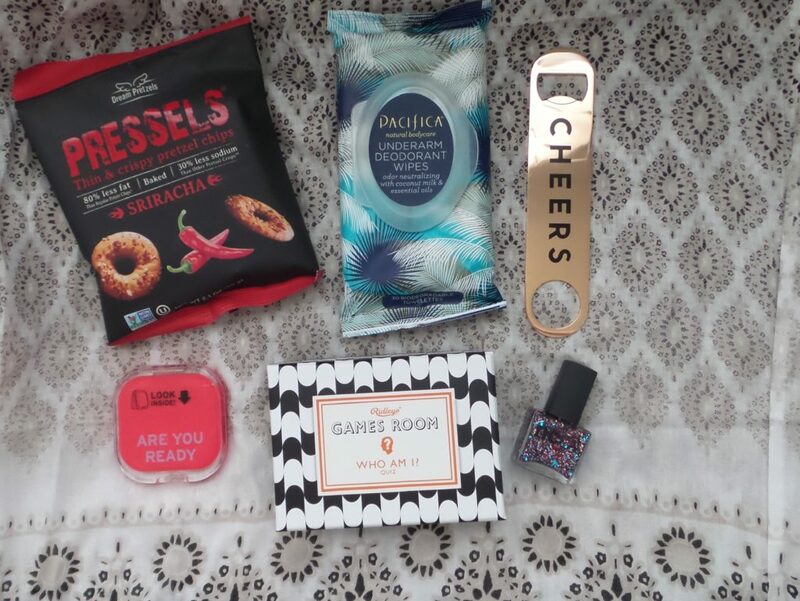 The June 2016 Popsugar Must Have box is one of my favorites, including items I can definitely use. All of the items are pictured on top of the Hat Attack Neutral Diamonds-Printed Sarong (Retail: $58). The sarong is definitely my favorite in this box. The Sriracha Pressels (Retail: $1.29) are so good. They’re like eating toasted bagel chips. The deodorant wipes come in three scents. The one pictured above is currently out of stock on their site. Like what you saw in this box? Well, you can buy each item individually or become a Popsugar Must Have subscriber and get a box of curated items that are new to the market (and will be a conversation piece among bloggers and fashionistas everywhere) valued at over $100 for $39.95/month (+ tax). The cheaper option is definitely to become a subscriber. I’ve been a subscriber for a few years now and Popsugar Must Have is definitely my favorite subscription box. They lead the pack in deciding which products will be the next “IT” thing on the market. I used to give away 3/4 of the box, but this past year, I found that I keep all of the items now. They have really upped their game by sending out qualitative products that I can find at a lot of the places I already shop. Join now. I think you’ll enjoy the service. For those who pulled everything out of their wardrobe and pared everything down, you may be in that state of not wanting to purchase anything new because you like how you have less clutter in your closet. Then there are people like me who went through the first KonMari round with their wardrobe and still continue to KonMari the hell out of their closet to no avail. I have a lot of things I do in life: work, play, relax, attend events, opera, theater, rock concerts, red carpet events, and so on. Simply put, I have the socialite wardrobe…a versatile wardrobe that goes along with whatever event may come my way. My wardrobe is prepared for anything. That means I have a closet full of gowns for the red carpet, opera and weddings. I have coats for the snow days, rainy days, extremely cold days and the special event coats. I also have the closet for work and everyday wear. In other words, I have the wardrobe I need to maintain the life I have. Although, that also means I need a bigger closet! After the first round of going through my closet, I was able to get rid of 5 large bags of clothing. Now, when I wear something or go through my closet, I look for even more stuff that I can get rid of that does not bring me joy. I am constantly trying to fine tune my wardrobe to get rid of the things I don’t need anymore. But there are times when you feel like you may need something a little different, but loathe the thought of adding yet another piece of clothing to your wardrobe or spending a lot of money on it. You’re afraid of going back to your old ways where you had more clothes than you had space. Maybe you have a big event coming up and need a new dress. Or maybe you have a hot date coming up and want something nice to wear for the evening. Or maybe you’re a fashion blogger and need new pieces coming in on a steady basis for your blog, but don’t want the clutter or to break the bank every month. Or maybe you just want to try out a new trend without truly investing in it completely. 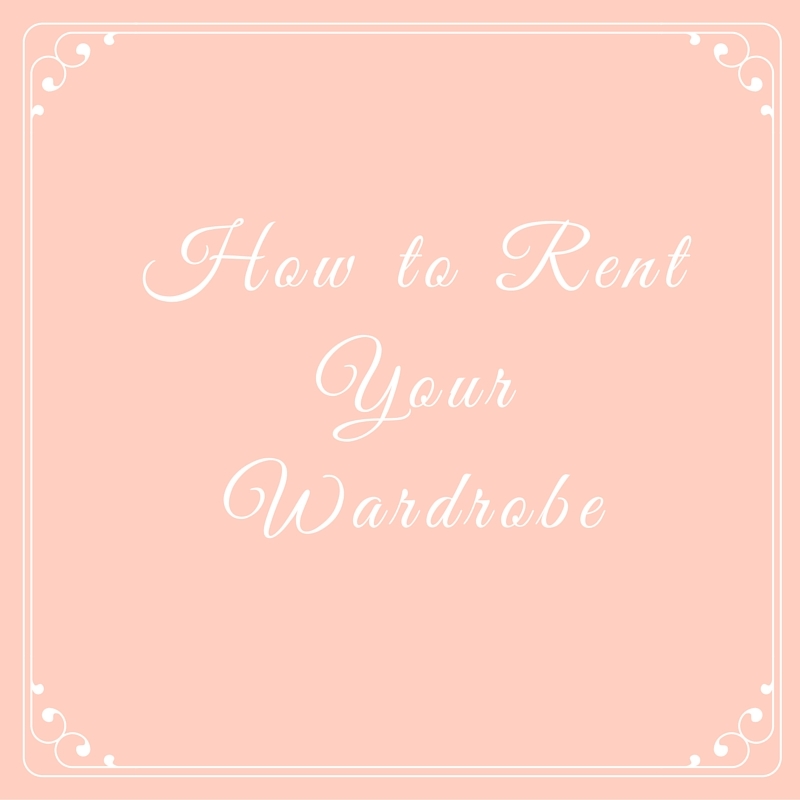 Whatever your fashion need, there’s a way now that you can rent your clothes without a) breaking the bank and b) without adding to the clutter. Le Tote offers wardrobe rentals for $59/month (Maternity boxes are $69/month). You pick the items you like, a box is curated based on the items you place in your virtual closet (in your size). What you get in each box: 2 shirts, pant/skirt/dress, and 2 accessories (i.e. 5 items). Wear it as many times as you like. Return the items for something new. If you decide to keep the item(s) (or the box), you will be billed accordingly. You can get $25 off your first box by using this LINK. Sizes go up to XXL for Le Tote. Rent the Runway has been known for years to rent designer gowns for special events. They have now gone UNLIMITED. What does that mean? Like Le Tote, you can rent up to 3 designer items at any time. Unlimited is slightly more expensive at $139/month (plus $29.95/year for unlimited shipping) because of the designers they use. For instance, for my first shipment, I requested a $1,690 Reed Krakoff handbag. I can keep the handbag for as long as I like and return it whenever I like. You get a new item whenever you return an item. If you are a handbag fanatic like me, you can use the service to rent handbags all of the time. I think this option is great, because other services where you can rent handbags, the price is contingent upon the handbag you are ‘borrowing.’ For instance, at Bag Borrow or Steal, a Chanel handbag could cost you $350/month to rent. It will cost you $350/month every month until you return the bag. While Rent the Runway Unlimited doesn’t currently carry Chanel, allowing a $1,690 handbag to be part of the rental for $139/month and you can keep the bag as long as you want, return it when you are done (plus, you get to have 2 additional items out at the same time)? That seems to be the steal. Sizes go up to size 22 at Rent the Runway Unlimited, but keep in mind, the options grow smaller for clothing when the sizing goes up (hopefully, since this is a new service that will change soon). A huge plus is that they do carry Eloquii! You can get $20 off your first order by clicking on this LINK. As for me, I subscribed to both rental services. I am using Le Tote for workwear, so that I can have a few extra options to play with by mixing it in with my current wardrobe. I am using Rent the Runway Unlimited for handbags, gowns, and dresses…mainly handbags. I love handbags. Gown season will be starting soon for me, so it’s nice to know I can order 3 items at a time for $139/month. If you’re constantly returning items at RTR Unlimited, you could get up to 6-9 designer items a month out of that $139/month. That is a serious savings. The positives to this type of service is that it creates less clutter in your home. You have a steady stream of fashion coming to your door. You’re also not paying an arm and a leg for new clothes, especially major designer clothing. For me, I could spend anywhere between $300-$1500/month on clothing and accessories. That, of course, is the old me. That kind of lifestyle was not only expensive, but it caused a major clutter issue at home. Spending close to $200/month on rentable fashion without adding to the clutter? To me, that is a major deal and stays in line with the clutter free life at home. I can still have new fashion pieces coming in all of the time for all aspects of my life, and I don’t have to keep the items around. After all, I’m sure there are plenty of ladies out there like me that would buy something, wear it once, decide you don’t like it and it ends up getting donated. Or maybe you get 3 wears out of it and then you decide you don’t like it anymore. Well, instead of throwing it out…just return it to get something different. One thing you need to keep in mind is that these rental services should only be used to COMPLEMENT your wardrobe. Buy the basics that you need. Rent the stuff you don’t need. Use the rental for special events or because you want to try out a new look. Use it because you want to constantly have something different to wear beyond your go to basics. The stuff you keep in your wardrobe are the items that bring you joy every single time you wear it. These are the items that fit you perfectly and make you feel good about yourself every single time you wear it (oftentimes, you wear these pieces a lot). The purpose of renting is to not add to your ‘things’ you have to take care of. It’s to prevent yourself from continuing to add clutter to your wardrobe because you like a new trend. Renting curbs your need to consume by adding more to your possessions. Instead, you can indulge in your fashion passion without having to add to your clutter. What I really love about Rent the Runway Unlimited is that I can indulge in my designer loves, especially handbags. I could have a different bag every week without having to spend thousands of dollars on each handbag. That, to me, was the major selling point, especially when I saw which bags I could try out. Of course, if you like the item and want to keep it, you can buy it. Because they are rentals, you can purchase the item at a discounted price. That, in itself, is worth using the service. You get to try it out for months (if you want) before truly committing to buying it. February’s PopSugar Must Have box arrived last week filled with some very awesome goodies. 1. Tarte Cosmetics Amazonian Clay 12-Hour Blush. 2. U.S. Apothecary Rose Water Bubble Bath. 3. ACME Party Box Company Bamboo Heart Cutting Board and Cheese Knife. 4. BaubleBar Mini Arrow Pendant Necklace [SIMILAR HERE]. 5. Lemon Berry Tinted Balm 17 ml by Figs & Rouge . 6. Chuao Chocolatier Ravishing Rocky Road Bar. 7. Sally Beauty FingerPaints Nail color. I didn’t keep the Tarte Cosmetics Amazonian Clay or the nail polish. I gave those two items away [due to skin sensitivities]. I loved the cutting board. I haven’t used it yet because it’s just so cute and looks stylishly good with the other cutting boards in the kitchen. What I loved most about the box was the BaubleBar necklace. The necklace I linked to above is similar, but not quite what I received. The one I received has pavé detailing and retailed at $32. You can get the similar one for $12. I’m a huge fan of BaubleBar (almost all of my jewelry is from them), so it’s nice when I receive any jewelry from them. Always qualitative and beautiful pieces from the company. I also loved the Figs & Rouge lip balm. I’m not a big fan of tinted lip balms, so even though this appears tinted, it’s not. It goes on clear. Also a good sign that this is truly 100% all natural, Matthew (my new cat) hates anything with a chemical smell. He always has this look on his face like, “How could you let me smell that?” when he smells any of my beauty products. With this lip balm, he actually liked it and tries to go in for a lot of kisses when I put it on. That means…this product is truly chemical free! As for the Chuao Chocolatier bar…OMG, it was so good. The surprise is in all of the extras in the bar…the marshmallows and the salt on the caramelized almonds. I’m also a big fan of their Spicy Maya bars that have a hint of cayenne in the chocolate. I imagine that this is the way chocolate would have tasted if we were truly able to taste the chocolate delicacies from the movie Chocolat. I haven’t tried the rose bubble bath yet, but I’m looking forward to it. 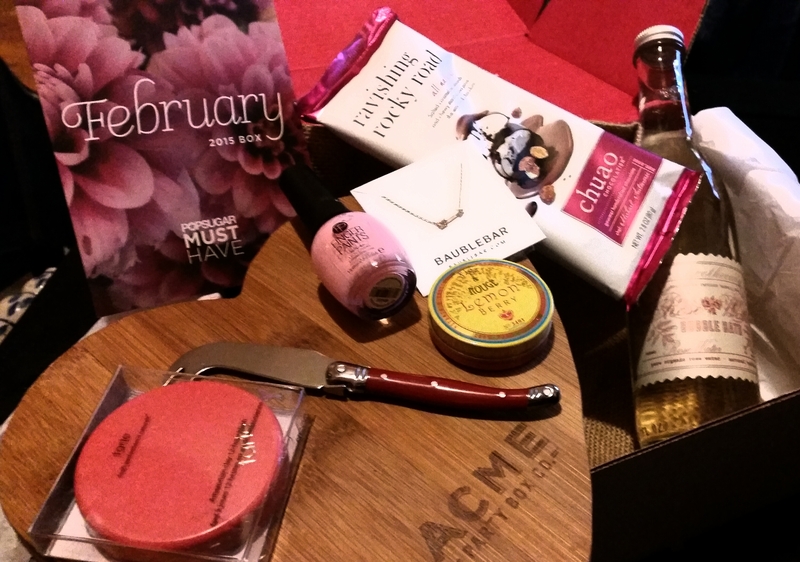 All in all, I liked the February box. The products may not be up to everyone’s cup of tea, but it had a lot of pluses in my book. The box is $42.75/month. Total cost of the items in this box retailed at $149.50. PopSugar is continuously proving that they are the best subscription box on the market. 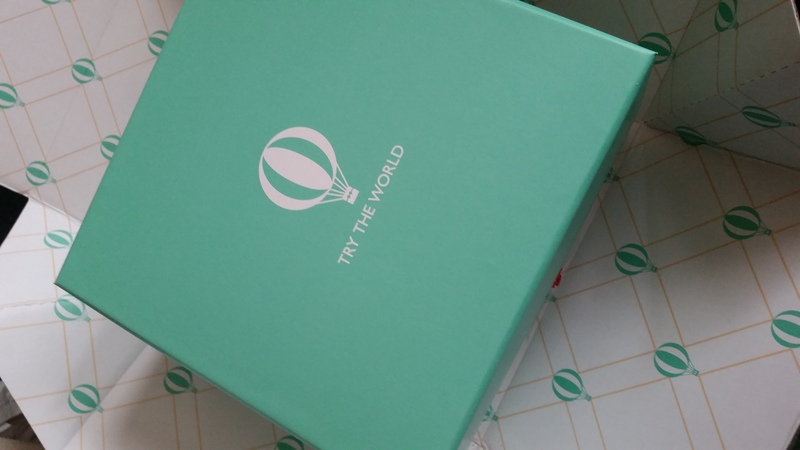 My latest Try the World box is the Paris Box. Who doesn’t love French food? This box included La Mère Poulard sablés (cookies), Maison D’Armorine salted butter caramels, Domaine Des Vignes whole grain mustard, Charles Antona Corsican cherries and thyme jam, Clément Faugier chestnut spread, Flagrants Désirs dark chocolate bar with raspberry and two fruit jellies. The whole grain mustard uses vinegar produced from grapes (similar to dijon) from the Vineyard at Domaine des Vignes. The difference between whole grain and dijon depends on the vinegar (or wine) used and the fact that the whole grain mustard is not completely grounded down like dijon. Whole grain mustard is a bit of a staple in any foodie kitchen, especially if you’re cooking up a lot of French food. When recipes call for dijon, I prefer to use the whole grain mustard in its stead. The sablés (cookies) are made with only 5 ingredients. The salted butter comes from Brittany. La Mère Poulard is a famous restaurant and bakery located in Mont-Saint Michel. 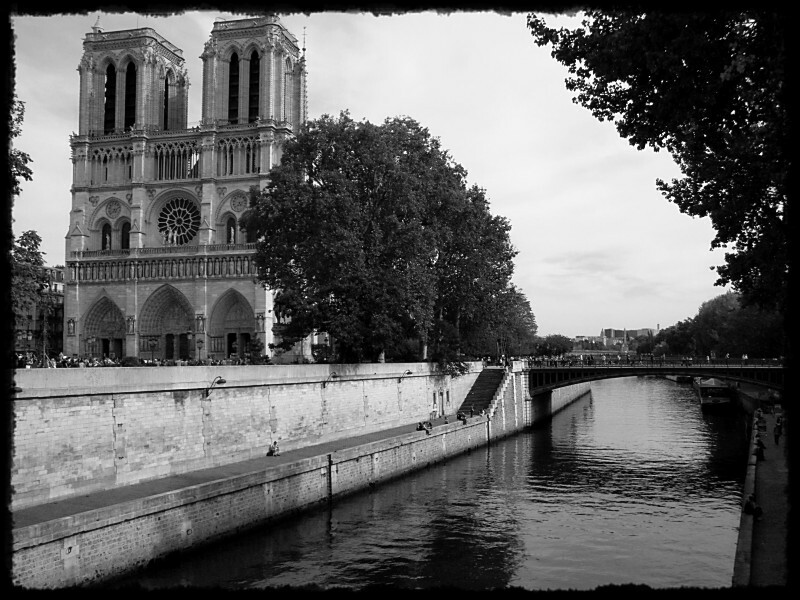 Notables such as Ernest Hemingway and Yves Saint Laurent have visited this restaurant. All in all, I really liked this box and the Venice Box. Both curated boxes are spot on for the essentials one needs in their kitchen from these two regions. They also pick the best sweets to add to the box. My little guy, Matthew, can attest to that. 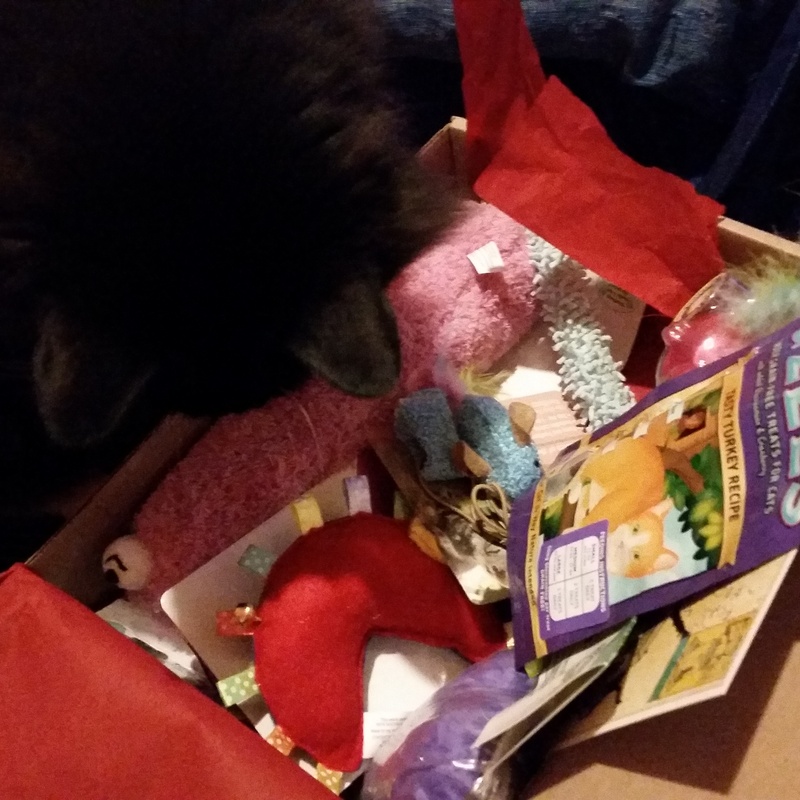 He was a little spoiled with his first subscription box from Kitnip. He assumed this new subscription box belonged to him as well. He started sorting through it before I could finish taking everything out of the box. He was pretty determined there was something in this box for him [no, he wasn’t playing in the red filler, he was pulling the food out of the box]. He even tried to open up the mustard thinking that must be where his treats are [he has thumbs, so he knows how to open up jars…at least ones that were previously opened]. We didn’t discover what he could have until I opened up the caramels this morning and took a bite out of one. It was so buttery and good, I thought he’d like to try it, so I gave him a little piece. The way his eyes lit up with pleasure…I think his determination was correct…there was indeed something in this box for him, too. If you’d like to order your own Try the World box, you can get $15 off your first box by subscribing HERE. Oh, the weather outside is frightful. But the fire is so delightful. So why don’t you pop a marshmallow on a stick, toast them over the fire, stick them in between two fudge graham crackers and have yourself a nice little treat during the winter months? But let’s kick that marshmallow up a notch. Butter Baked Goods, a shop based in Vancouver, B.C., sells flavored marshmallows like strawberry, vanilla, toasted coconut, mint, coffee, raspberry, passion fruit, rose, violet, pumpkin spice, maple, pistachio, chocolate, lemon, matcha tea, peppermint, eggnog and gingerbread. It gives your s’mores or hot cocoa a little bit of an unexpected, but tasty surprise. Butter Baked Goods marshmallows are sold in the US at places like Crate & Barrel and Dean & Deluca. Each bag comes with 10 marshmallows. 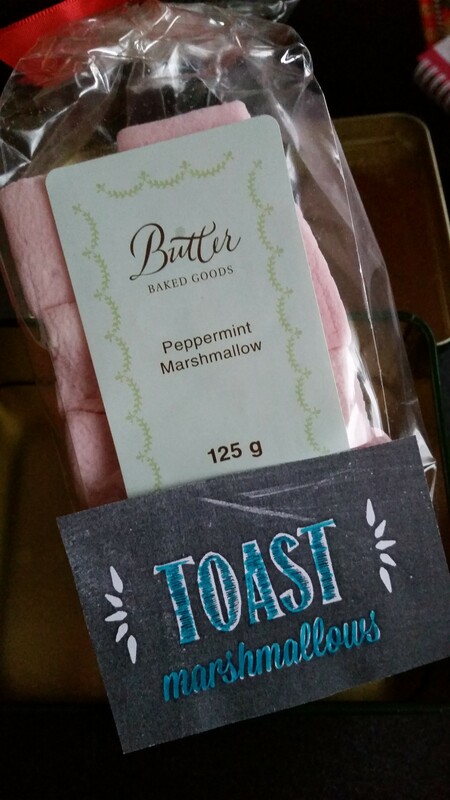 I ordered the peppermint flavored marshmallows as part of my Advent gifts. They tasted so good with a cup of hot cocoa. It even made the s’mores more delectable. While you can go old school and add the regular milk chocolate and graham crackers, I like to take that step out and just stick the toasted marshmallow in between two fudge graham crackers. Believe it or not, it actually makes for a better s’more. 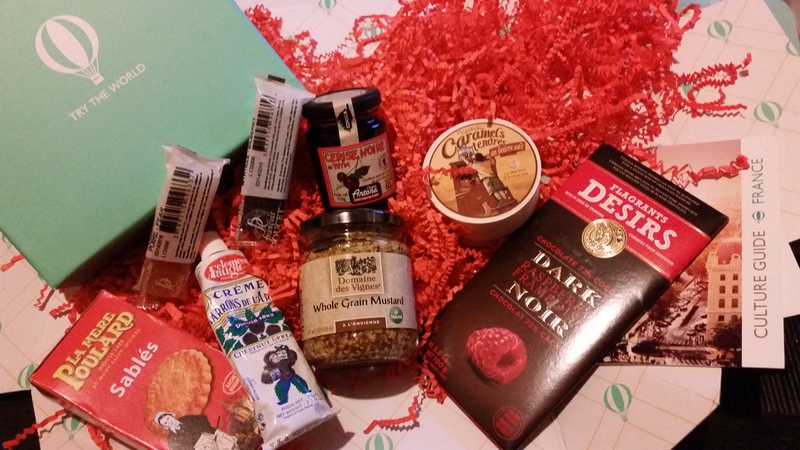 If you’re like me and have a little critter (or two or several) running around your home, you may want to consider ordering them their very own subscription box. 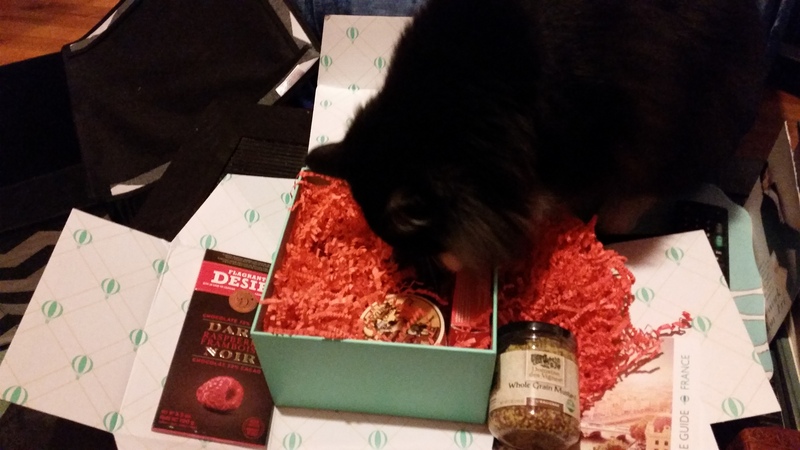 For Matthew and Surita, they loved everything about this box curated for cats from Kitnip Box. I gave Surita the Play-N-Squeak Mouse and the Refillable Catnip Heart Toy (because Matthew doesn’t like catnip). She had such a great time with both…that is, until Matthew stole them both from her. He actually broke the mouse, setting off the chirping. I thought the battery would die out sooner or later, but after 3 hours, I got out of bed, cut the thing open and took out the sound box. Matthew couldn’t sleep with all the chirping, so he hid in my office to try to sleep. When I came out to silence the toy, he came running out, thankful the noise was being brought to an end. Twinkle Tweet toy. Available at Amazon.com. Another favorite he was still playing with the next morning was the Twinkle Tweet. 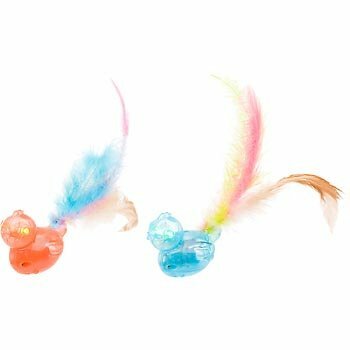 It’s a plastic toy with a few feathers in it that lights up and chirps. He is a big fan of chirping toys and things that light up. He likes to stalk the toy and then pounce on it from out of nowhere. As for the treats, this box included Zuke’s G-Zees Tender Grain-Free Treats. It’s different than what my two little ones are used to, but they loved it and gobbled it all up. So as much as my two little ones loved their first Kitnip Box, there was also a special theme. It makes this first box for Matthew a little extra special. Since Matthew is a recent adoption, it makes sense to help out other little ones that still haven’t found a forever home yet. 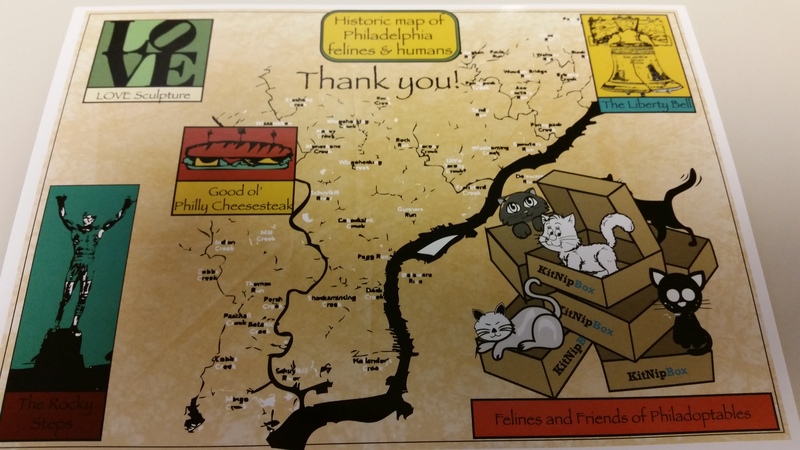 A portion of the February box proceeds goes to help Philadoptables in Philadelphia, to help out other furry pals while they are still in a shelter. You can order a Kitnip Box for your feline pals HERE. See below for more information and a special discount code [from the Kitnip mailer]. 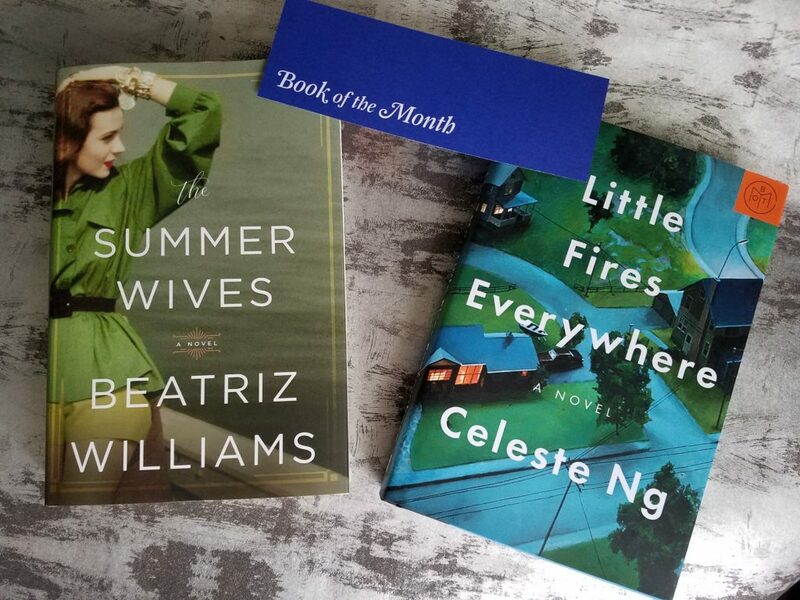 There are a lot of subscription box services out there lately, but nothing that is as close to representing the foodie side of “Perfectionist Wannabe” as the Try The World box service. I got my first box a couple of weeks ago and I have to say…I am beyond impressed with what you get for $39. My first curated box had a “Venice” theme. Included in it were a lot of food items representing the region…and food items that any Italian foodie should already have stocked in their pantry. But then again, some of this stuff is hard to find unless you get it directly from an Italian food market. 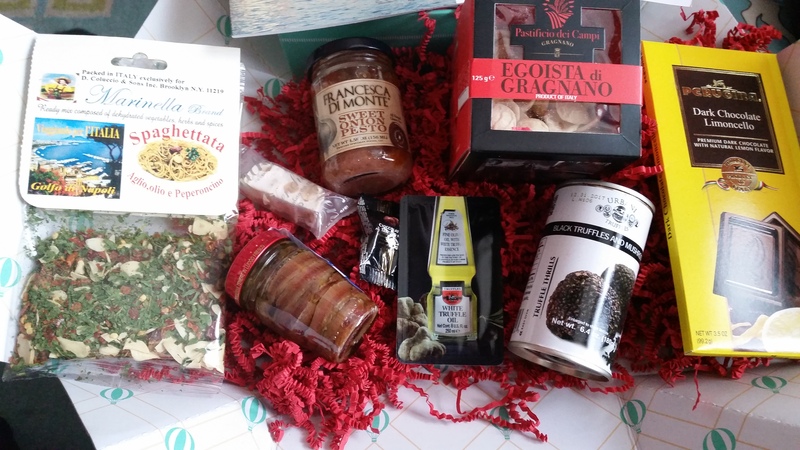 I loved everything about this box, especially the Dark Chocolate Limoncello. I try to eat dark chocolate for health reasons, but it’s always too bitter and not a pleasant experience. This Perugina chocolate bar was just right and delightful. The black truffles and mushrooms were a surprise. I had ordered the Oeuf Mimosa (truffle and caviar deviled eggs) at Todd English’s Ca Va Brasserie in NYC a couple of weeks ago. It had a very distinguished taste to it. Opening up this can of truffles and I found the main ingredient to the Oeuf Mimosa. I tried this in some couscous to add a little flavor. Just a little bit can go a very long way. 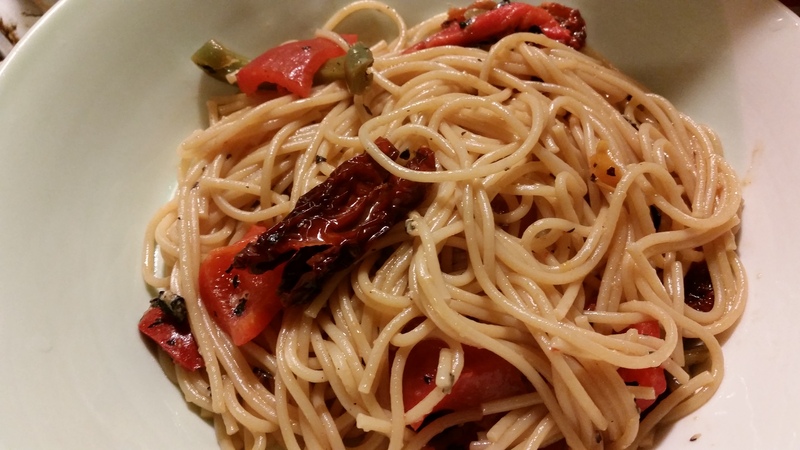 The Spaghettata mixture of herbs was a delight. I warmed it up in some oil, added some bell peppers, sweet bell peppers and sun-dried tomatoes (that I picked up in Venice) then tossed in some spaghetti and parmesan cheese for a satisfying meal during the Super Bowl. The sweet onion pesto included in the box, I put on top of tilapia. It was so simple and, oh so delicious. What I like about this box is that it allows you to try out new ingredients from different areas of the world. It’s also not too expensive and you get qualitative ingredients to experiment with. Each box comes with a few recipes to try and an informational background on the region. I’m looking forward to seeing what my next box has in store. Have you tried “Try the World?” If so, what did you think?